Migration to a new country is the ultimate life change. When my partner and I arrived from London 10 years ago, we were full of excitement about the unknown opportunities ahead. Adelaide’s been good to us. We’re citizens now, happy to call Australia home. There is, though, a big drawback: despite our luck befriending wonderful people here, we’re over 10,000 miles away from family and old friends. Saying goodbye to them was heartbreaking, so whenever someone decides to pay us a visit, we’re thrilled. I felt that same thrill when the Art Gallery of South Australia announced a major coup: selected masterpieces from the Musée d’Orsay in Paris were coming to Adelaide. As an art historian, I’d always made the most of London’s many galleries, as well as the proximity of those in Europe. Certain artworks in those galleries are like old friends I’ve grown attached to over the decades. Same, too, for those in Paris which I frequented whenever I stayed with my parents, who used to live just outside the city. My late mother and I loved to spend the day gallery-hopping in Paris. The Musée d’Orsay was ­– along with the Musée Picasso – at the top of our list, coming in above the crowded, albeit splendidly endowed, Louvre. We first visited it shortly after it opened in 1986, and fell in love with its airy vaulted halls and Beaux-Arts architecture that hinted at its past life as a Métro station. My mother adored Monet’s waterlily series, in particular, and we’d sit on the gallery benches to meditate upon the vast canvases. When I left Europe I accepted, with a sense of melancholy, that I’d no longer have the luxury of visiting those old friends quite so often. So I could hardly wait for Colours of Impressionism: Masterpieces from the Musée d’Orsay to arrive; to see which works had been selected for the logistically fraught journey to Adelaide. I was curious to see if my perception of familiar paintings had been altered by 10 years in South Australia. To my surprise, it had. The new landscape palette I now live with has conditioned my eye to the extent that seeing the familiar paintings in this exhibition triggered a nostalgia so strong it made me draw breath. Here were landscape colours I hadn’t seen for a long time. Visiting the Heysen family home in Hahndorf, I’d been struck to learn that Hans Heysen struggled in his first year in Europe, disheartened by the lack of light, to capture the colour of its skies and landscapes. It seems so obvious: the colours of the Australian landscape are indeed radically different from those of Europe. I was glad to see Claude Monet’s La Pie (The Magpie, 1868-69) made it into this show. In this magnificent work, a solitary magpie is perched – perhaps only for a moment – on a wooden gate that offers a glimpse through a snow-hummocked reed fence to the iridescent fields beyond. It captures precisely the unique light and, somehow, the muffled silence that comes after snowfall. The sun filters through the crystalline air, casting the purple, blue and pink shadows of early morning or late afternoon in the snow. La Pie was so shockingly modern at the time that the painting was rejected by the Paris Salon. 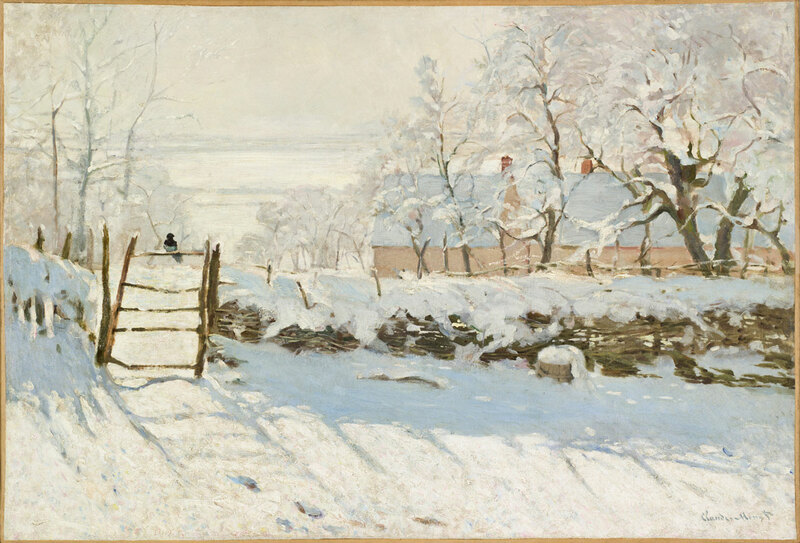 While I’ve always been a fan of the painting itself, it’s only after a decade of snow-free winters that I fully appreciate the impressionistic yet precise choice of colours with which Monet captured that singular winter light, the feeling of such a day. Add to this the magpie, the small, solitary living thing in the middle of this large canvas: the smaller, less vocal and less brazen cousin of the iconic Australian magpie. On the first morning of our new lives in Adelaide, I woke to the strangest birdcall I’d ever heard, and was amazed to learn what it was. European ones don’t sound anything like this. After 10 years, though, the Aussie magpie has become as familiar as the robin. I feel such affection for this bird, despite its springtime ambushes. I look afresh at La Pie; it’s acquired an attractive patina of new memories overlaying the old, and I experience it differently now. Gustave Caillebotte’s Vue de Toits [Effet de Neige], (Rooftops in the Snow [Snow Effect], 1878) is also a winter scene, this time an upper-floor window view of Paris. It breaks with the artistic conformity of the time in that it represents a seemingly random slice of the Parisian skyline, just as might have been glimpsed from an artist’s studio window – a pleasing randomness aspired to by the Impressionists. Though the rooftops are muffled with snow, there’s a sense of the pulsing city streets below, the purple-silver haze of the grey winter sky mottled with traces of the city’s smoky pollution. Some of the colours here might be found in a Sydney Long or Hans Heysen, but are used to altogether different effect. 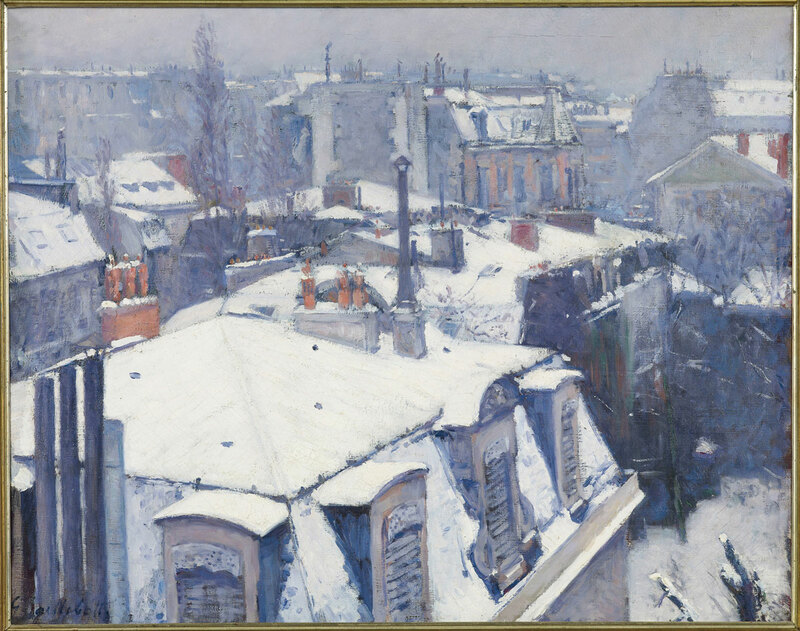 When I saw the Caillebotte on AGSA’s walls, nostalgia reared its head again, not only for the icy winters of my past or the rooftops of Paris, but for my old city life lived out of a fourth-floor flat in central London; elevated up in a milky grey sky, I’d feel the heart of the city beating below. The view from my window couldn’t be more different now: lemon, olive and fig trees shelter multi-coloured birds, framed, usually, by an azure sky. I once saw Vue de Toits as a slice of real life. Now it’s a window onto a past life. 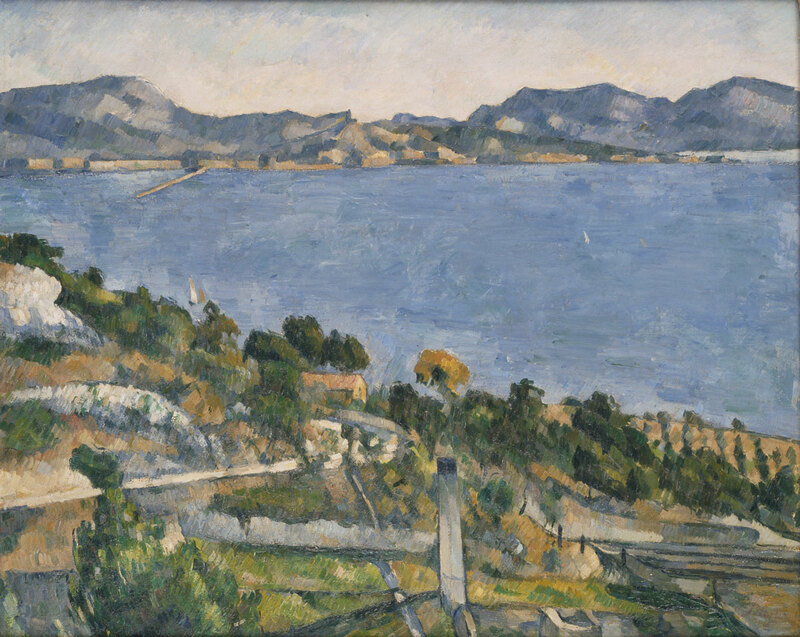 Le Golfe de Marseille vu de L’Estaque (The Gulf of Marseilles seen from L’Estaque, 1878-79) is by Paul Cézanne. The climate in the South of France is similar to South Australia’s; on summer holidays there in my 20s, I’d drink in the bright light I thirsted for and recharged my London-worn batteries with languid ocean swims. I longed to live somewhere like that, but was too caught up in the city treadmill to make the move. When I visited Estaque in 2006 it was during a work trip to the Marseilles office of the company I worked for. It was the summer before I made the decision to move to Australia, a particularly pressured time in my career, and I remember standing with a French colleague who was showing me around the area, gazing out at a view much like the one in Cézanne’s painting, wondering what the hell I was doing living so far from nature in overcast and overcrowded London. Cézanne was similarly taken by the colour contrast between Provence and Île-de-France, and went on to paint many shimmering, fragmented portraits of Mont St Victoire near Aix-en-Provence, a place I had the privilege of experiencing that same work trip. There are South Australian colours in Le Golfe de Marseilles: the terracotta roofs and Mediterranean trees give away its location, but otherwise, the pinky-blue haze in the hills on the horizon could well be a view of the Flinders Ranges. Looking at this painting, I’m reminded of the seismic shift away from my old life. I experience this painting differently, too. No longer a scene that triggers the perpetual longing I once had for bright light and warm seas, it’s more a reminder of the life I have now, of how lucky I am to be able to experience this kind of wilderness not far from my doorstep. I do miss Europe’s galleries from time to time. But seeing old friends anew in such a significant exhibition right here in Adelaide has made me happier than ever to live here. The thoughtful curation of the 65 paintings in this exhibition by Marine Kisiel and Paul Perrin of the Musée d’Orsay explores the colour techniques used by the Impressionists and offers something for everyone, from the everyday art lover, to artists and academics. You’ll find precious works by Berthe Morrisot, August Renoir, Alfred Sisley, Camille Pissarro et al. It may be one of the most important exhibitions ever seen in Adelaide. It’s absolutely wonderful. Be sure not to miss it. Colours of Impressionism: Masterpieces from the Musée d’Orsay is at the Art Gallery of South Australia until July 29. Katherine Arguile has a BA Hons. in Chinese Studies and Art History from Cambridge University, where she was an art critic for Varsity newspaper. She also has a Masters specialising in post-World War II British art from London University’s Courtauld Institute of Art, and a PhD in Creative Writing from the University of Adelaide.